Ever had the urge to turn your home into a life-sized curiosity cabinet? Would you love to surround yourself with full-scale lions, oversized insects, and realistic depictions of human skeletons? Do you often construct your own personal Night At The Museum-style fantasies? 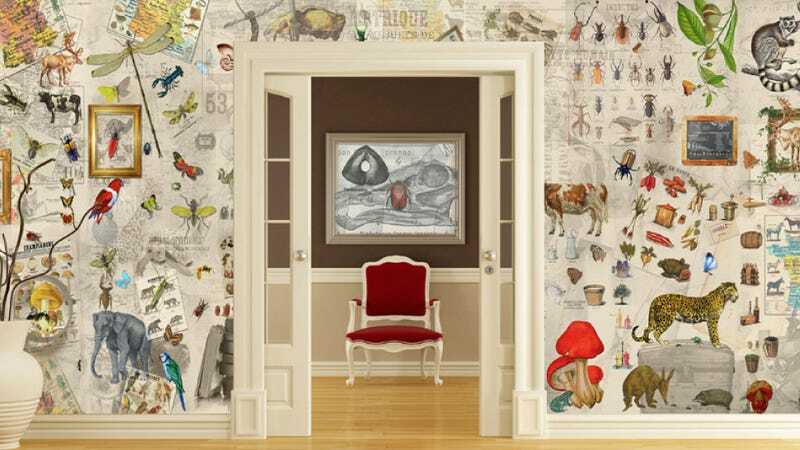 If you’ve got a taste for the strange but are a bit short on space, this new Panoramiques wallpaper collection might be just the 2D accent to liven up your home decor. The series is a collaboration between French design brand NeoDKo and Paris-based boutique Deyrolle, which has been a definitive outpost for taxidermy, entomology, fossils, shells, pedagogical boards, and all-around fascinating array of natural history ephemera since its eponymous founder Jean-Baptiste opened its doors in 1831. Though a fire nearly decimated its iconic Wunderkammer in 2008, the historical hotspot has bounced back into a better-than-ever bizarro wonderland of flora and fauna.